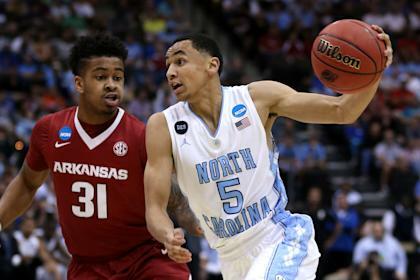 North Carolina is expected to be a prime contender for the 2016 men’s basketball national championship. Some outlets have the Tar Heels ranked No. 1 in their early Top 25s. Will the Heels even get a postseason chance to show how good they are? The speed (or lack thereof) with which the wheels of NCAA justice turn could have a profound impact on North Carolina’s 2015-16 season – and, by extension, on the college basketball season as a whole. If a postseason ban is a possible penalty in the school’s sprawling academic fraud case, when could it be delivered and administered? In time for next season or not? As with most things NCAA-related, the answer is complicated. But if North Carolina goes through a full extension of the process, the NCAA and school will be on a tight deadline to resolve this early enough in 2016 to affect the Tar Heels’ postseason. Unless the school self-imposes its own ban first. And wouldn’t that be something in a potential championship season? North Carolina received its Notice of Allegations on May 22. That starts the clock. Generally speaking, a Committee on Infractions hearing would occur six months from now, which would be sometime in November. Then it’s a matter of time (approximately 60-90 days) before the COI produces a ruling and applies any penalties. That would be February 2016 at the latest – still in time to rule UNC either in or out of next year’s tournament. But there are other factors to consider as we get more specific with the timetable. As of this writing, we still don’t know what that notice contains, but the fact that enforcement wrapped up its investigation in less than a year from its announced resumption in June 2014 is at least a little bit surprising given the scope of what the UNC-commissioned Wainstein Report detailed last fall. The report documented about 1,500 athletes taking bogus classes over a period of 18 years. But we don’t know yet to what extent the report has been applied to the NCAA’s inquiry. North Carolina has 90 days per NCAA bylaws to file its response to the Notice of Allegations. That puts the due date on that document at Aug. 22, though it could file sooner or ask for an extension. From there the ball goes back into NCAA enforcement court. It has 60 days, per the NCAA rules manual, to produce an advocacy reply – basically a response to the school’s response to the Notice of Allegations – and a summary of the agreed-upon facts in the case. If the earlier timetable still holds, those documents would be due on Oct. 22. Then it is time to put the case on the Committee on Infractions hearing docket. There are more COI hearings now than they’re used to be, which helps speed up the process, but there still has to be some advance notice for all parties involved. And the holidays tend to complicate the process in November and December. If Carolina stays off the hearing docket until January, that may clear the Heels’ path to play in the 2016 NCAA tourney. After the hearing, a Committee on Infractions ruling generally is handed down within 60-90 days. Selection Sunday 2016 is March 13. So the date of that COI hearing – late 2015 vs. early 2016 – could be very important. The most recent major-infactions, big-program case to work through the NCAA pipeline was Syracuse basketball. The Orange went before the COI at the end of October 2014. The penalties were handed down in early March 2015. That case was similarly broad in scope. But as we all know, no two NCAA cases are the same. And there are other factors to consider. What about all the heavy lifting done by the Wainstein Report and previous school-initiated inquiries? Maybe there isn’t as much left for both sides to dissect in the coming months, because it’s already been dissected. And what if North Carolina plays a little stall ball? This is the school that invented the Four Corners, after all. Any delay tactics – including an appeal of the COI ruling – could be used to the advantage of a program intent on playing in next year’s tournament. Or this could simply be too big, broad and punitive for UNC not to be as painstaking as possible. “If it’s an issue of concern for the university, this could be a case where the school legitimately takes longer to reply than usual,” Brown said. Wrapping this whole thing up before March 13, 2016, may take a rush job. And if there is one case that probably should not be rushed in terms of thoroughness and fairness, this would be it. The NCAA already has endured heavy criticism for its initial stance several years ago that the UNC academic scandal did not fit its rule book and thus was not being investigated. Once the full scope of the scandal was known last fall, the outcry for NCAA action regarding one of the Ivory Tower programs in college sports intensified. So there is a lot at stake. For blueblood North Carolina basketball, for Hall of Fame coach Roy Williams, for a team that may be talented enough to win the school’s first national title since 2009, for the other teams aspiring to win a title – and for the NCAA itself.